Okra or gumbo (Hibiscus esculentus) is a stout, erect, branching plant, 1.5 to 6 feet tall. Like cotton, it belongs to the family of mallows. The plants are cultivated as annuals for their large, soft, immature pods. Although of no great importance in the United States, it is commonly found in home gardens in the South. It is a tender plant and thrives best in hot weather. Seed of the Mammoth long-podded variety was planted at Norman, Okla., in rows 3.5 feet apart, Apr. 27. Several seeds were placed in a hill, but later the seedlings were thinned to single strong plants 3 feet apart. Early Development.--About 3 weeks later (May 20) the plants were 5 inches tall and each possessed 4 leaves with blades 2 to 2.5 inches in length. Okra has a strong taproot which penetrates almost vertically downward. The taproot was about 5 millimeters in diameter and reached a depth of 16 inches. A total of 24 to 35 laterals, the largest 1.5 millimeters thick, ran horizontally from just beneath the soil surface to a depth of 8 inches. The roots originated on four sides of the taproot. A maximum spread of 18 inches was reached at the 5-inch level. A few of the deeper laterals pursued an obliquely downward course. All were furnished with a profuse growth of laterals 0.1 to 3 inches in length. The rate of branching was about 8 laterals per inch (Fig. 59). The roots were white and rather tender. Fig. 59.--One-half of the root system of Mammoth long-podded okra about 3 weeks after planting. Later Development.--The branched stems had reached a height of 8 inches by June 12. They were ½ inch in diameter and clothed with numerous leaves, the largest being 8 inches in width. Flower buds were appearing. The strong taproots tapered rapidly from 12 millimeters in diameter near the soil surface to 1 millimeter at a depth of 10 inches. They pursued their rather vertically downward course to depths of 20 to 22 inches. The strong laterals in the surface 8 inches of soil ran in a generally horizontal course to distances of 15 to 32 inches from the base of the plant. A total of 29 roots was found on a plant of average size on the first 8 inches of taproot. These are shown in surface view in Fig. 60. The widely divergent roots were branched at the rate of 4 to 6 laterals per inch; only the longest bore sublaterals. Thus a rather large volume of the rich, moist, surface soil was quite well ramified. Below 8 inches the branches were almost as numerous but decreased rapidly in length toward the growing tip from a maximum length of only 5 inches. The white, slightly fleshy roots were rather tough. Fig. 60.--Surface view of the roots of okra occupying the first foot of soil. The plant is 46 days old. Maturing Plants.--By July 22 the well-branched plants were 4.5 feet tall and had a stem diameter of 2 inches. They had made such a vigorous growth that the soil between the 3.5-foot rows was quite concealed. The plants had been fruiting for some time and the pods were exceptionally large. Growth, however, was proceeding vigorously. The taproot, now nearly 2 inches thick near the soil surface, gave rise to so many major branches that it tapered rapidly, and was only 3 millimeters in diameter at a depth of 1 foot. It pursued a rather devious downward course to a depth of 4.5 feet. The laterals of the surface 8 inches had increased enormously in size. From 11 to 17 were found on various plants with diameters of 5 to 20 millimeters. Even 2 feet from the base of the plant some of these strong roots were 3 millimeters thick. The maximum lateral spread had been increased from 32 inches (June 12) to 79 inches. Many roots, of course, did not spread so widely. But nearly all of those originating in the surface 8 inches ended near the soil surface or turned downward near their extremities for only a few inches. The branches below the 8-inch level had also made a vigorous development. Several laterals 1 to 2 millimeters thick originated from the taproot at depths of 10 to 20 inches. These ran outward and downward or outward for only a few inches and then turned abruptly downward and paralleled the course of the taproot. Frequently, they reached depths even greater than that of the taproot. Aside from these larger roots numerous others occurred in the four rows on the sides of the taproot. Usually about 8 to 12 roots arose from each inch of the taproot. Summary.--Young plants of okra have a strong taproot and many nearly equally long, mostly horizontal branches whose numerous laterals fill the surface 8 inches of soil. When the flower buds appear, the 25 or more horizontally spreading roots extend from 0.5 to 2.5 feet from the base of the plant. They are well furnished with absorbing rootlets. The taproot attains approximately a depth of 2 feet, but below 8 inches the branches are short. Mature plants have taproots 2 inches thick and 4.5 feet deep. The surface laterals become much thickened and extend widely, some to 6 feet. Some turn downward a few inches near their ends but none penetrate deeply. Several branches originate below the 8-inch level; running obliquely outward and then far downward, they supplement the absorbing area of the well-branched taproot. 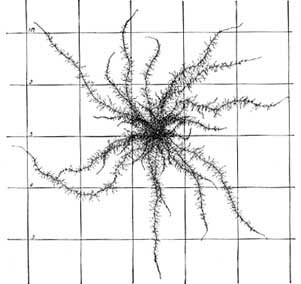 Thus the root system consists of two rather distinct parts: a shallow, widely spreading portion thoroughly ramifying the surface 18 inches of soil to a distance of 6 feet on all sides of the plant; and a deeply penetrating, well-branched taproot which gains access to the water and nutrients in a soil column about 2 feet thick and which extends to a 4-foot level. This latter portion of the root system develop rather late. Thus the soil between the widely spaced plants is thoroughly occupied. Other Investigations on Okra.--The roots of a plant of a dwarf variety of okra were washed from the soil at Geneva, N. Y., in September.